Emma Roberson, standing center, and Minh Anh Nguyen, back right, take part in the opening ceremony for the education abroad program in Vietnam. During the ceremony, students bonded at a nice restaurant, sang Karoke, danced and took pictures in front of the program sign. 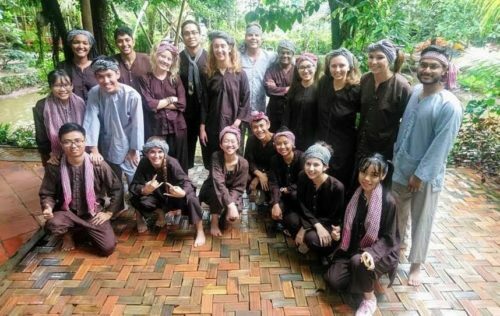 Emma Roberson wasn’t sure what to expect when she began studying Vietnam as part of an immersive education abroad program offered to USF St. Petersburg students. But she quickly learned to let go of any preconceived ideas she had about the Southeast Asian nation. Roberson was one of 15 students enrolled in “USF in Vietnam: Society, Energy & Humanity.” The class provides a deep cultural immersion that helps students better understand the country and its people, said Frank Biafora, USF St. Petersburg Professor of Sociology, who teaches the program in Vietnam. Roberson was paired with Minh Anh Nguyen, a soon to be Junior studying English Teaching at Vinh University. While touring Vietnam and examining topics such as the role of the individual in society and the use and conservation of energy, Roberson got to know, become friends with and learn from her roommate. For Nguyen, the program offered the chance to know more about the world outside her country. The education abroad program in Vietnam is a three-week course. This year, the students began the first week in South Vietnam, where they learned about the U.S. involvement in the Vietnam conflict, known there as the American War, and the more recent political, economic and diplomatic normalization. Weeks two and three were held in North Vietnam just south of Hanoi, in the Nhe Anh Province. Students pose for a photo with Professor Biafora during one of their many excursions in Vietnam. Students spent their time attending classes in the morning and afternoons learning about Vietnamese culture and customs while going on excursions to rural villages, religious temples, educational centers and a children’s orphanage. 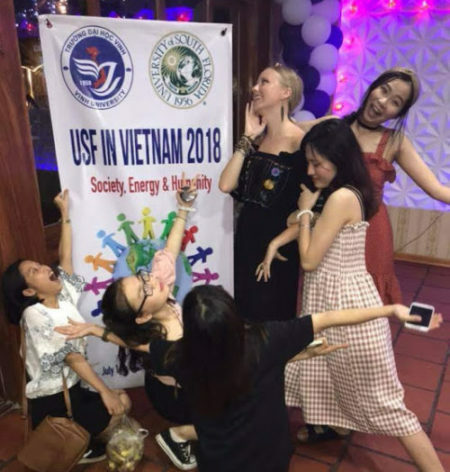 Perhaps the most unique and popular aspect of the class is the decision to match the American and Vietnamese students. They are paired based on initial impressions, and many formed lasting bonds. Her most lasting memories of studying abroad, Roberson believes, will be the subtle experiences and knowledge she picked up along the way, like haggling in the markets, trying on traditional dresses and the passion for karaoke in Vietnam. View all of Emma’s photos of her experience in Vietnam at: https://photos.app.goo.gl/afNvVGv2xhFdFvyf7.